Please Note: These pages are for general information only. All sensitive information has been eliminated prior to posting. Our membership will continue to receive a printed Lodge notice by mail, containing all pertinent information. GARDEN CITY LODGE, A.F. & A.M.
and all Masons are cordially invited. A. To receive and read applications. B. To transact any other business that may legally come before the Lodge. London Broil with a fish alt. by reservations only. *Per a dispensation granted by the Most Worshipful Grand Master. no later than Sunday, April 11, 2019. Rt. Wor. 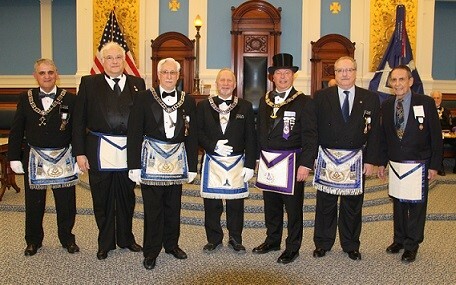 Kenneth L. Brown, District Deputy Grand Master of the Fifth Masonic District, accompanied by Wor. Mark J. Collins, Sr., District Deputy Grand Marshal, Wor. Robert A. Caron, District Deputy Grand Secretary, and who will be accompanied by a suite of distinguished Masons as he makes a Fraternal Visit to our Lodge. Get Well Wishes are sent to Wor. A. David Brown, recovering from a fall, and to Bro. Scott Herzog, recuperating at home following recent surgery. Please notify the Service Committee Chairman, Wor. Ross Scribner, the Master or Secretary with any news concerning the welfare of the Brethren and their families. Things didn’t go as expected at our March Communication. Despite all the hard work your officers put into preparing for the degree work, nobody anticipated that yours truly would end up laid up at home with an injured knee! But Garden City Lodge rallied together to ensure our candidate would still enjoy a quality experience. The officers and the ritual team stepped up and covered the work, and I hope you’re as proud of them as I am. Special kudos to Brother Mark Elsner for stepping in to Master’s work, and to Worshipful Peter Newman, Worshipful Steve Fradkoff, and Brothers Herb Philpott and Nick Crimaldi for their excellent work on the Second and Third Sections of the degree, and to Worshipful Jeff Levy for coordinating the Ritual Team. Brethren, Table Lodge is upon us! I don’t know about you, but Table Lodge is by far my favorite experience as a Mason. Once again we will be joined by the Officers and Brethren of Boston University Lodge, and it should be a fun time. I do hope you’ll be there to join us. If you can only make one meeting a year, it should be Table Lodge. Brethren I’d like to remind you that there is an anonymous member of the lodge who has volunteered to cover the cost of a meal for any brother who may be struggling to afford it. If this is something you would like to take advantage of, please notify me. Everything will be handled very discreetly. We are brothers, we help each other. As we get into the spring months, your Nominating Committee is working hard planning for the upcoming year. Brethren, have you considered becoming an officer, or serving your lodge in some other capacity? We all have our strengths and weaknesses and different ways we can contribute to making our lodge stronger. Becoming an officer and serving you as Master has been more rewarding than I ever dreamed, and I urge you to consider it. Be well, brethren, and I’ll see you at lodge! It’s that time of the year once again where dues collections get serious. More than 20 of our brethren have yet to pay their dues to the lodge. Letters have been sent to those brothers informing them of the need to pay their dues. Their names have been given to the Master and if no payments have been made by May, their names will be read in open lodge at the May communication and if payments are not received by June, a vote to suspend will be taken in lodge. All procedures as set by Grand Lodge are being strictly followed. If you have recently received a letter, please take due notice thereof and govern yourself accordingly. At the March Communication of Garden City Lodge, five brothers were presented with 50-year Veterans Medals by Rt. Wor. Kenneth L. Brown, District Deputy Grand Master. Pictured, l-r, are Wor. Robert H. Brown, Bro. Martin D. Shapiro, Wor. Steven P. Fradkoff, Bro. Mark D. Elsner, Senior Warden/Acting Master, Rt. Wor. Kenneth L. Brown, DDGM, Wor. Robert N. Goldstein, and Bro. William Levy. Two other Brothers, Bro. Howard U. Passman and Bro. Frederick Sternberg, were also eligible to receive their medals but were unable to attend.